Here's an interesting new children's picture book. 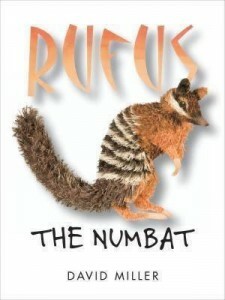 Rufus the Numbat was written and illustrated by David Miller and published by Ford Street Publishing (2010). I predict Rufus the Numbat will have youngsters instantly reaching out to touch its pages. Much of the book is based on intricate paper sculptures, giving it a wonderful, textured 3D effect. Rufus himself is a work of art, with delicate fringed paper showing us his striped fur and bushy tail. It's great to have a picture book for children about the numbat, who isn't quite as famous as his Aussie animal relatives. Rufus is only passing through the town, but he seems to have the unfortunate effect of precipitating incidents wherever he goes. Cyclists lose their balance, painters fall off ladders, even passing parades are affected. All our numbat wants is a quiet life in the bush - will he ever find it again? Rufus the Numbat is perfect for kids who are just starting out on their reading journey. It's similar to a wordless picture book, because the text is minimal. In fact, kids can work out the whole story from the illustrations. It's also a book of anticipation - children will love predicting what's going to happen next. And I'm positive they'll want to add paper techniques to their own art work after they've identified where paper has been folded, scored, layered and fringed to make the illustrations in this lovely book. Don't take my word for it - check out the trailer below to see more of Rufus the Numbat. This sounds adorable. I love books that introduce animals/species I never knew about. Thanks, Susan!! I've never seen a numbat in the wild, Terry, but I'd like to. Meanwhile, this book is a nudge in that direction. Yay! I love modern books about our Aussie wildlife! This one looks lovely! Search out David Miller's books in your library/bookstore, Jeanne. His earlier books have even more paper art work.